Bryan Radzin; Author – A synchronistic journey into the heart of politics and what makes us human. Setting goals comes easy for most folks, but accomplishing them is another thing altogether. 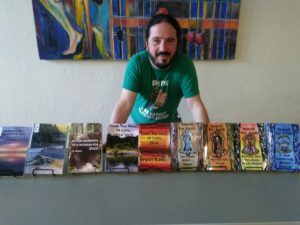 Bryan Radzin, a graduate of Humboldt State University and local resident has accomplished his goal of publishing a book each year by his birthday in July. For eight consecutive years, this goal has been successfully met. Radzin’s first three books were precursors to his novel, “Search for Truth…The Seeker Begins” and his latest book titled “Search for Truth…A Path Forward” provides a path to unity through critical mass, and illuminating the illusion of power, so we can build that new day now. The sixth book is currently in the working stages, due out fall 2019. He is participating monthly (first Friday of the month in June-Oct) at the Trinidad Art Festival by the Lighthouse restaurant. He is also the Westhaven Center for the Arts writer in residence for 2019. His riveting novels weave accountability, humanism and truth throughout. It blends real issues with a philosophical/spiritual approach to uncover Truths. It is a synchronistic journey into the realm of politics and what makes us human.